Virginia Barton Mother, educator, activist and ‘gentle advocate’. Virginia Barton has been many things during her life – a mother, educator, activist – but son Gordon “Buzzy” Barton, said the words “gentle advocate” best describe her. “Everything she’s accomplished, she’s accomplished with a smile on her face,” he said. That includes working to change housing practices as a member of the North Shore chapter of the NAACP, co-founding the thriving institution that is the Community Minority Cultural Center, or advocating for literacy programs such as the federal Title I program. “She always told me I could be anything I wanted to be,” said Buzzy, a retired Lynn firefighter and basketball coach. “She gave me that confidence. The course of Virginia’s life changed when, after a fire devastated her home in 1963, forcing the family to temporarily split up, she had a hard time finding new housing. Virginia also had an art school scholarship rescinded when those awarding the scholarship learned she was an African-American. But progress did come, and Virginia can see the fruits of her labors. 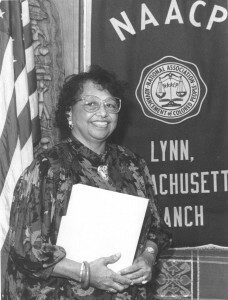 There are now several permanent reminders of her work, such as Barton Hall at Gordon College or the Virginia Barton Family Resource Center in the Lynn School Administration building. Some of the honors she has received along the way include the Distinguished Service Award from the Yankee Clipper Council of the Boy Scouts of America, the Sallie Hacker Award from the Lynn Museum, and the prestigious Clara Barton Humanitarian Award from the American Red Cross of Massachusetts Bay. But both Patricia and Buzzy say their mother, with all of her accomplishments, is proudest of her family, which also includes daughters Barbara Barton, Donna Barton, Roberta Davis, the late Lori Barton Holiday, adopted daughters Carol Brown and Paulette Hartwell, as well as grandchildren and great-grandchildren.